Ok y'all! 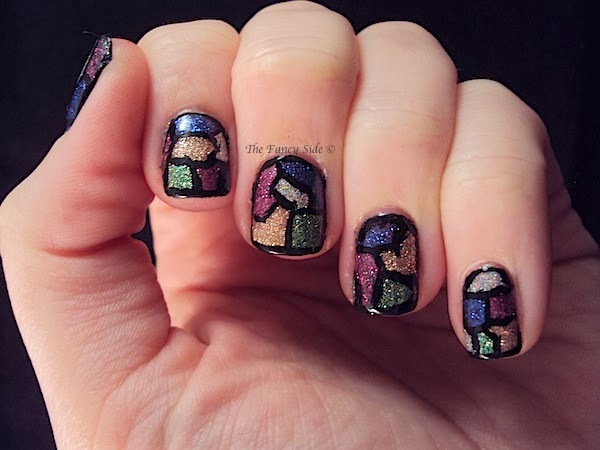 I have some manis to show you that were shot with my old camera, but I can't wait to show you pics from my new camera, so this mani cut the line. One of the things I asked for for Christmas was the Lime Crime Les Desserts d' Antoinette collection. I never actually thought I would get them as J thinks I have to much polish (we all know I disagree with him). But he came through and man am I in love. Look at these pretties. Also, I'm in love with my new camera!! (AND I just realized the orange polish isn't in this picture, but I have it, I swear). 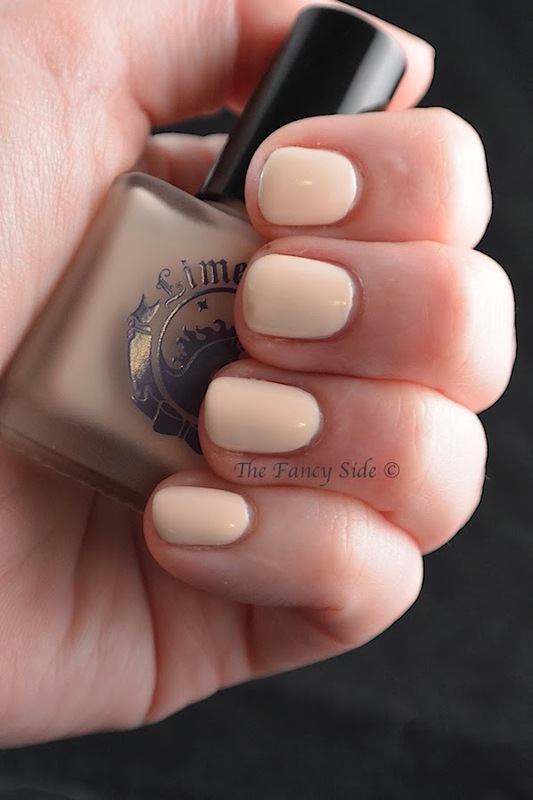 For this mani I started off with a base of Lime Crime Milky Ways, a buff neutral polish with peach undertones. It is so unique and gorgeous. Then for an accent nail I used the chevron tape from Sticky Nails on my ring finger and painted over it with Lavendairy. On the rest of my fingers I added small purple round studs. 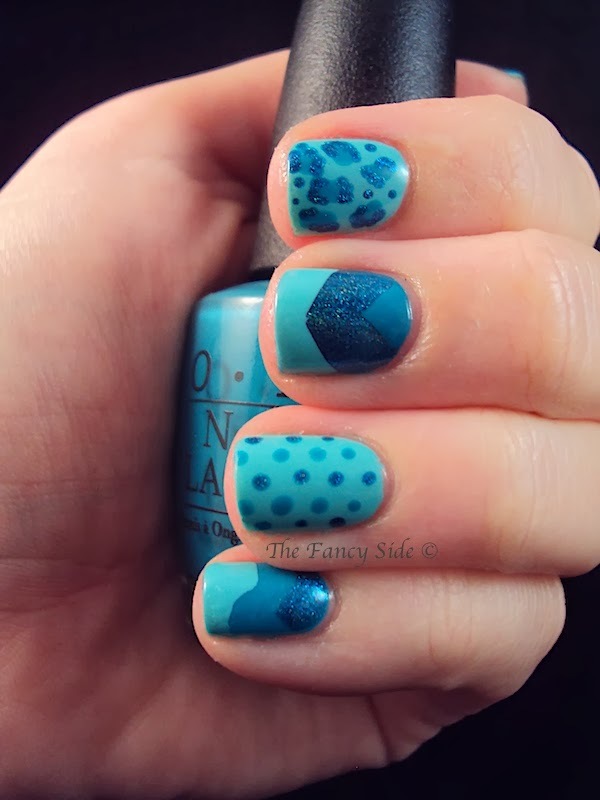 I really enjoy the look of this mani! Super fun but simple. Also, can you all tell I changed my nail shape? When they are square I always manage to break just the corners, so after a bad break, I thought maybe I should give round nails a go. So far I like them, and they seem a bit stronger. 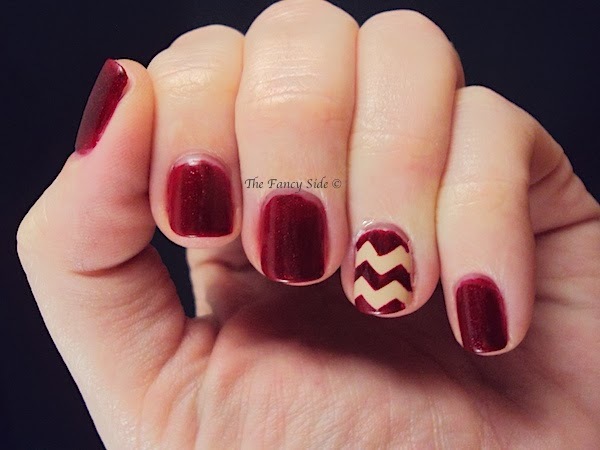 This was the one semi-holiday inspired mani I did. I started off with a base of Maybelline Color Show Impeccable Greys with an accent nail of Cirque Chainmail. I wore this look on it's own for a day, because it was pretty just like this. The next day I went back in and added details using Charme Whitehall, a beautiful sheer white tinted jelly filled with white and sheer white glitter in all shapes and sizes, plus holographic sparkles. 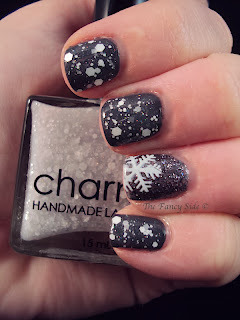 Doesn't it look like a late night snowfall on my nails? 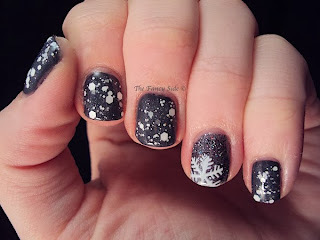 For my accent nail I stamped a snowflake with Konad White using the Winstonia plate W120. Please excuse my lobster hands in these last 2 photos. I made the mistake of going out with gloves and my hands took a beating. 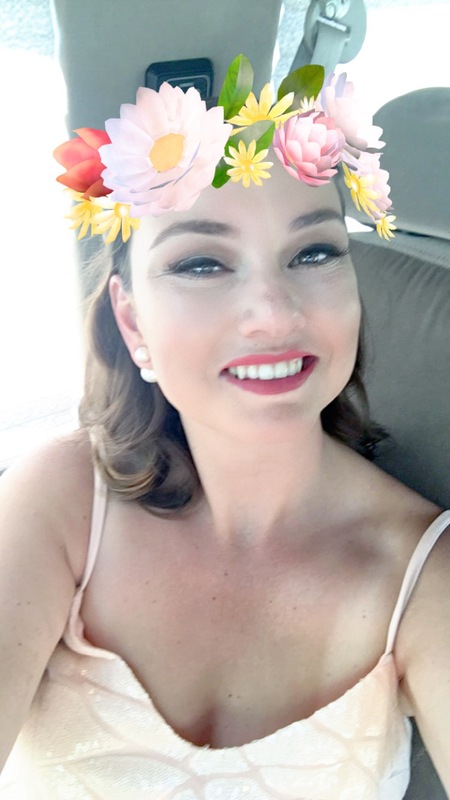 Did you have a wonderful holiday? I'd love to hear what you did. 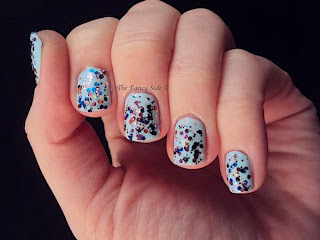 I am on a roll with glitter toppers lately. 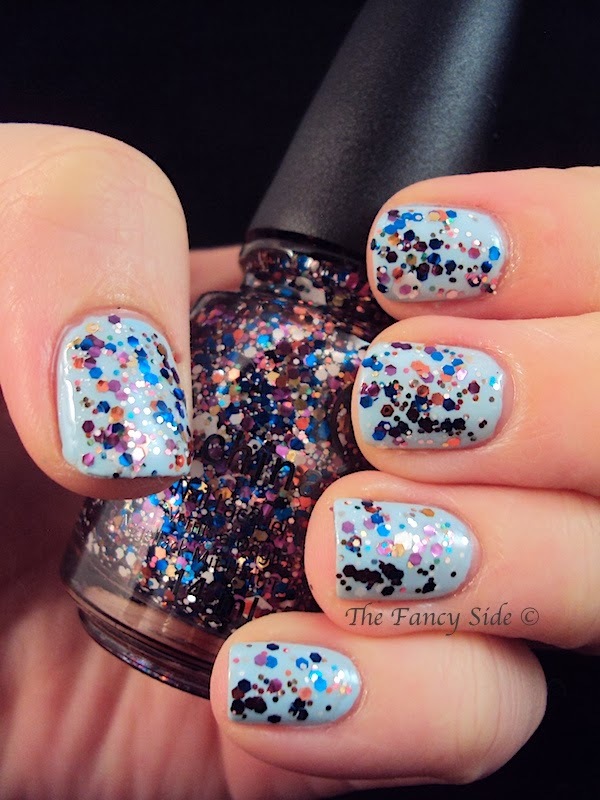 I think I'm just in that kind of a mood, you know....GLITTER EVERYTHING! China Glaze Your Present Required is from the latest holiday collection. It is made up of multi sized glitter in purple, green, blue, white, orange, gold, and more. It's a unique mix in my collection, which of course makes me happy. I've paired it over Sephora X Infatuated. 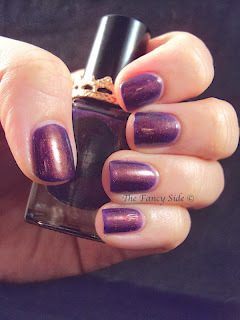 Today I have China Glaze Fang-tastic over Sephora X Indelible. 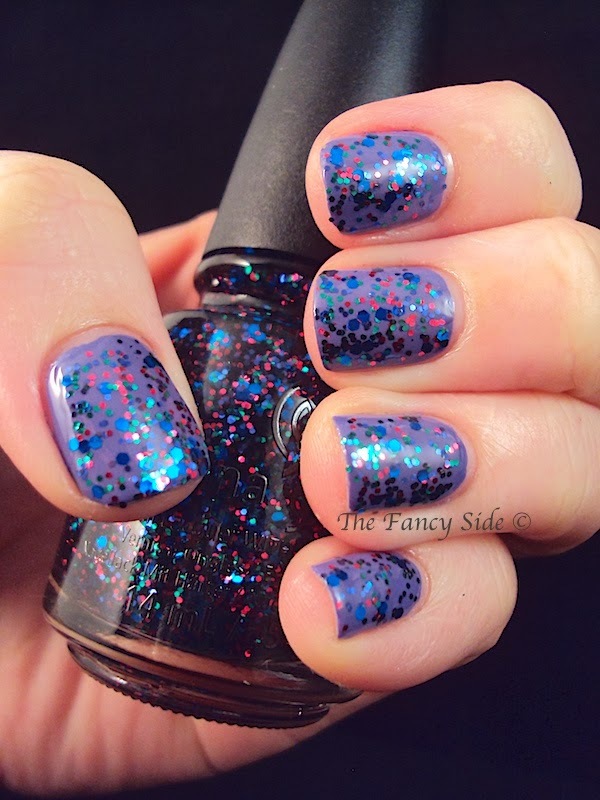 Fang-tastic is a mix of fuschia pink, blue, and green hex glitter in a clear base. 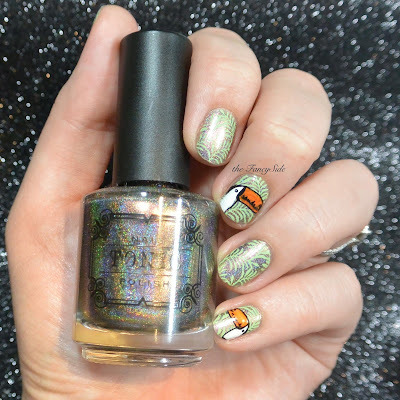 It's a pretty glitter topper which honestly doesn't scream Halloween to me, but I like it. Let's talk red nails for a minute. 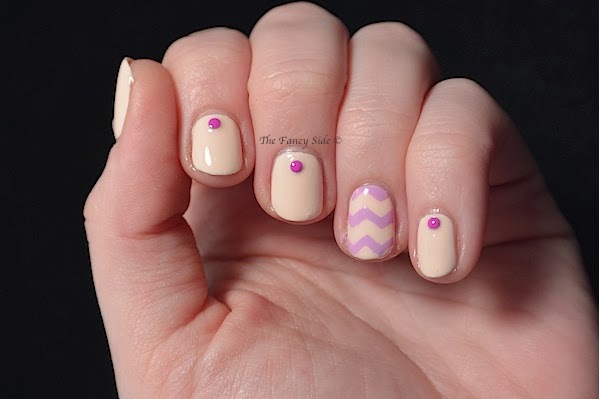 When I was a freshman in college, I stuck to very simple girly colors for my nails, mostly pinks and light purples. I was not adventurous at all. Strange, I'm sure considering how crazy I'll go with my nails now. 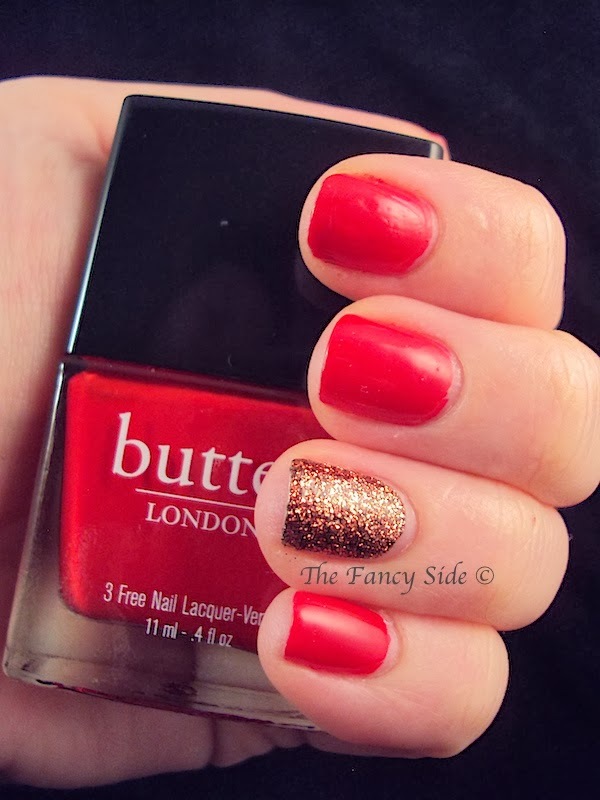 I remember one time, my friend Jayne talked me into wearing red polish. I wore it for an hour tops, then took it off, mostly because I thought it looked so mature and just wasn't me. Present me wishes past me had rocked that red nail, but I make up for that mistake now. Everyone has a favorite red nail polish. 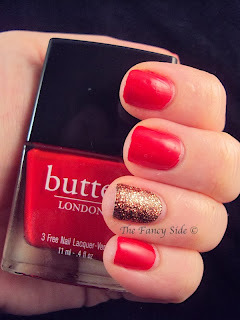 There are a TON of options out there and I own a lot of them, but I always come back to Butter London's Pillar Box Red. It's the perfect shade of red for me, especially my skin tone. I just adore it. Here I've worn it with an accent nail of Butter London Bit Faker (full swatch here) just to add a little pizazz. 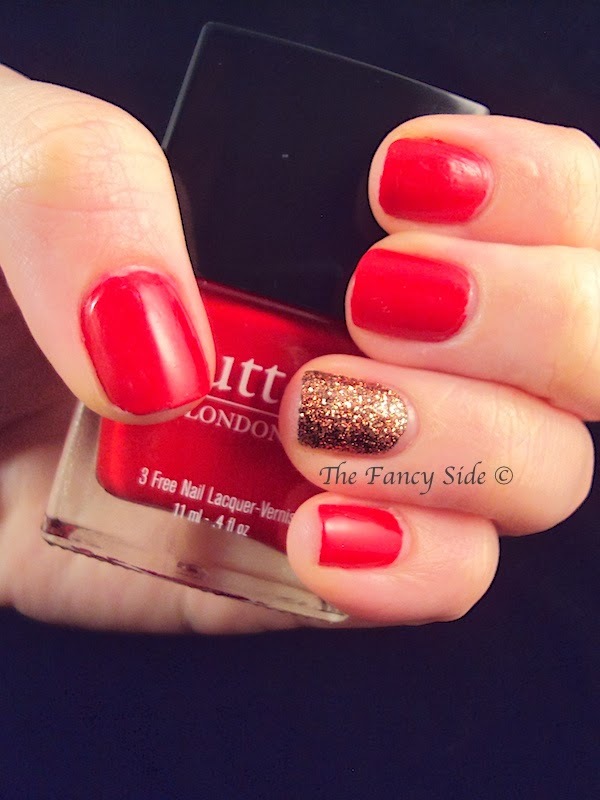 What is your favorite red polish? Today I have Sephora X's Galaxy. This is from their Celestial's collection. It is a navy blue polish with silver glitters in it. 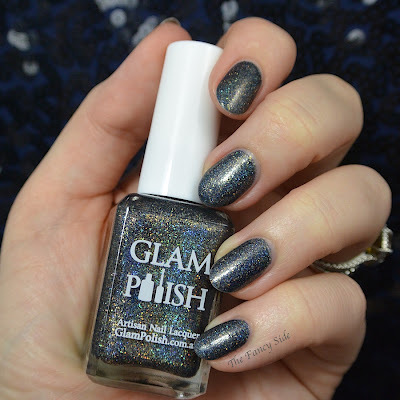 It's one of those polishes were in the right light it looks black versus blue. Application was great, here you see 2 easy coats. 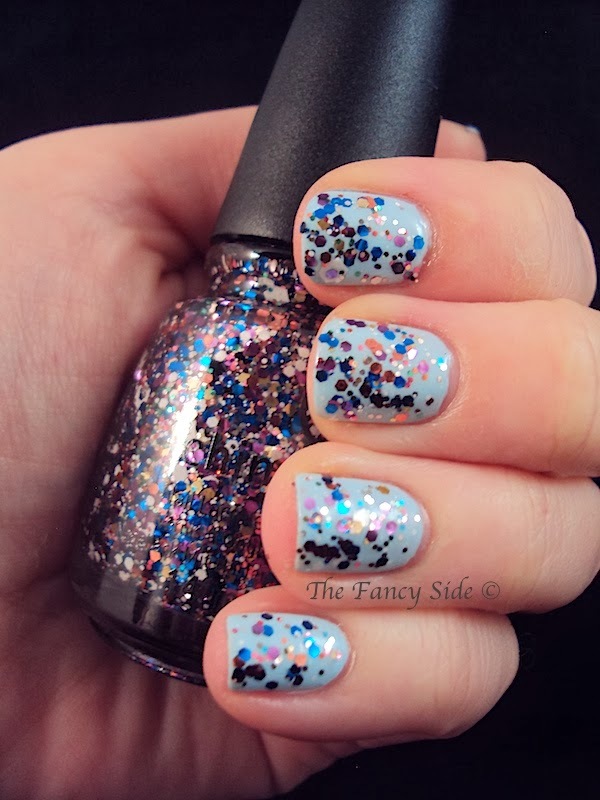 I do like the sparkle in this polish. 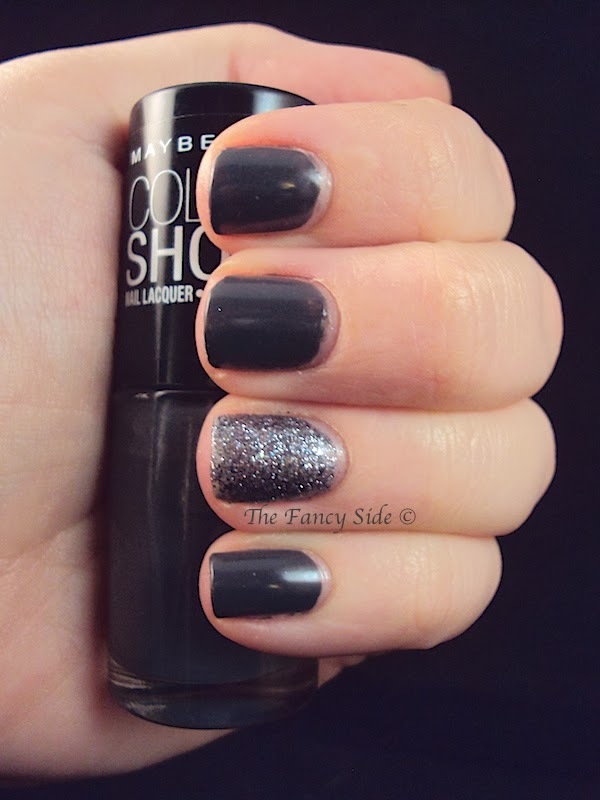 Sephora X's new line of polishes has yet to let me down. I also bought the 22 and I'm working on getting them all swatched up to show you. Hopefully I'll be able to knock the rest out this weekend and show you by next week. 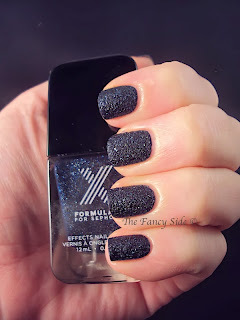 Have you tried any Sephora X's yet? What do you think? Happy Thanksgiving Ya'll! Well tomorrow, but as I plan on spending the morning on a plane and the rest of the day gorging myself on delicious food, I'm wishing you a Happy Turkey day now. 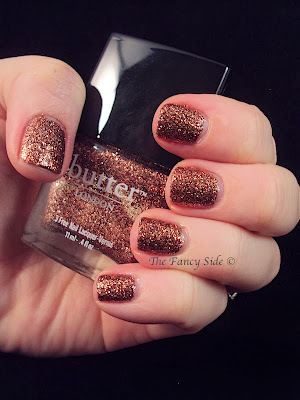 I wanted to wear something simple but pretty for the holiday, so I went with Butter London's Bit Faker. 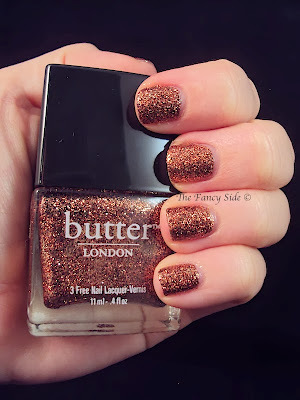 Bit Faker is a beautiful full coverage bronze glitter. It is super unique and simply stunning. This is a stand-alone beauty. See how pretty. 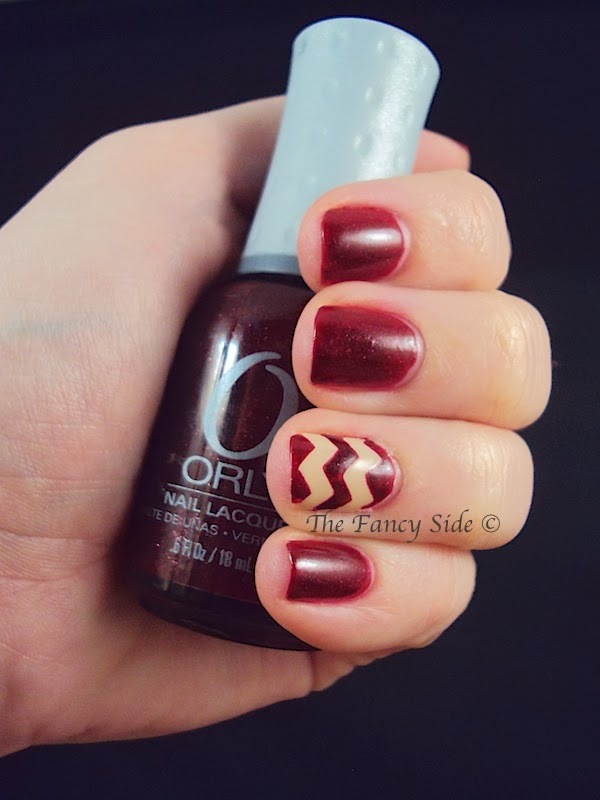 It's the perfect fall color. I adore it and I think it is the perfect shade to wear on my fingers for the holiday. When Frosso and I went to the Renegade Craft Fair the other day, there was one specific polish I knew I would be walking away from the Cirque booth with. That polish was Cirque Coronation. I'm calling it now people! This is a must have! Seeing as it's limited edition, you might want to hurry and order yours now. 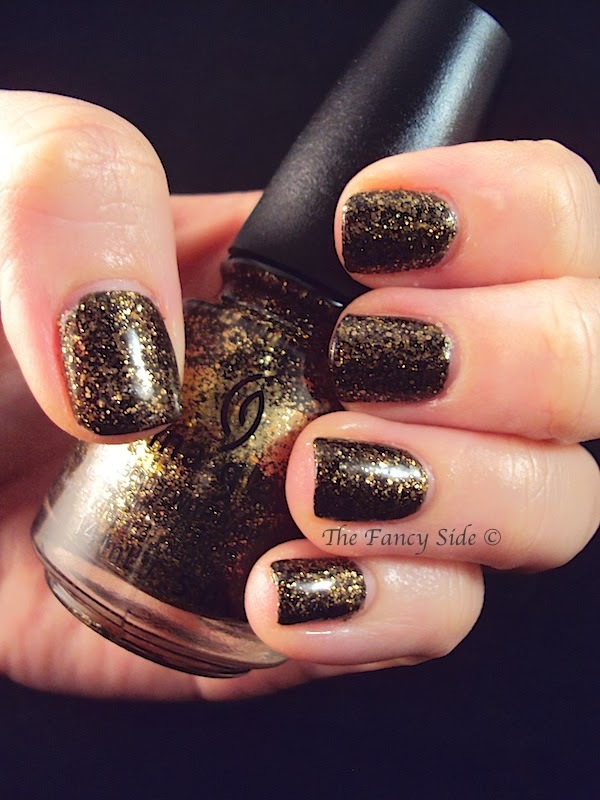 Purchase of this polish also gets you a LE Jeannie Vianney rose gold plated lace ring. 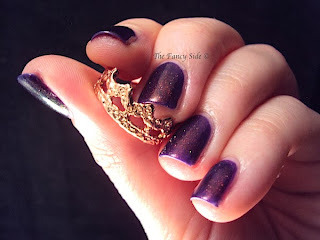 The ring is adjustable so it fits most fingers and it is also GORGEOUS! 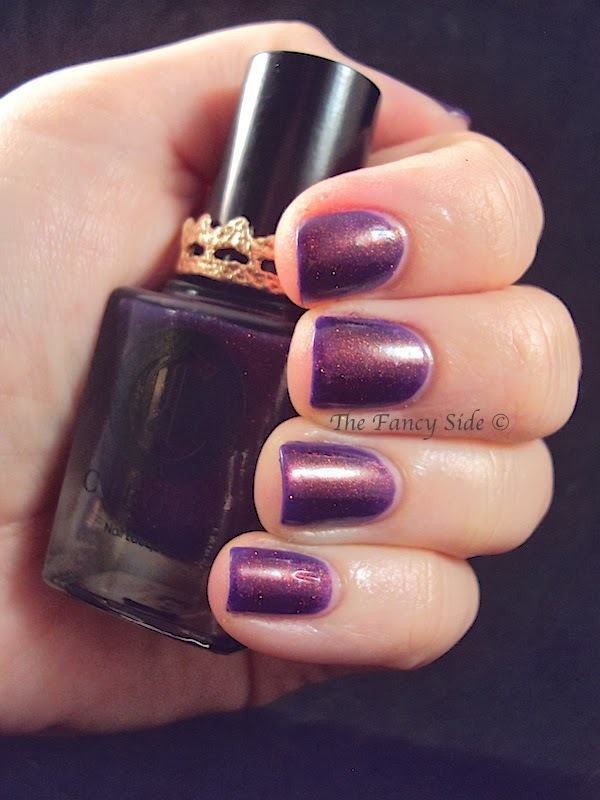 Coronation is a royal purple jelly filled with copper shimmer and the occasional holographic flash. My GAWD this is freaking beautiful. I love this polish and I love the ring. I am so happy that I managed to get my hands on this set. On Saturday Frosso from Lacquer Me Silly took the train into the city and we had all the fun shopping at a giant craft fair, where Cirque happened to have a booth. Okay, so we went mainly for Cirque but we scored some other awesome stuff too. 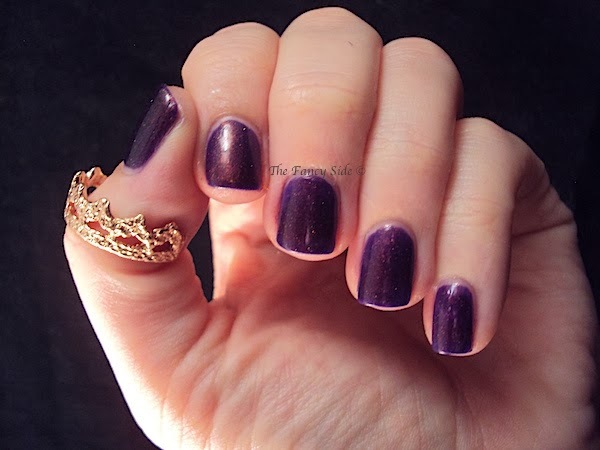 I'll show you my haul soon, but first I want to show you the nails I wore for the momentous meet up. 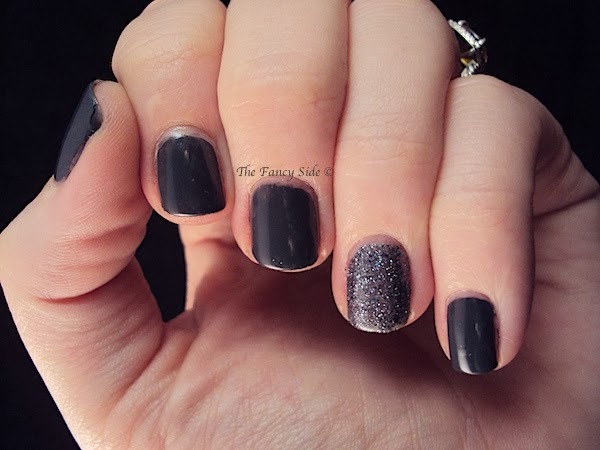 I used 3 polishes for this look. 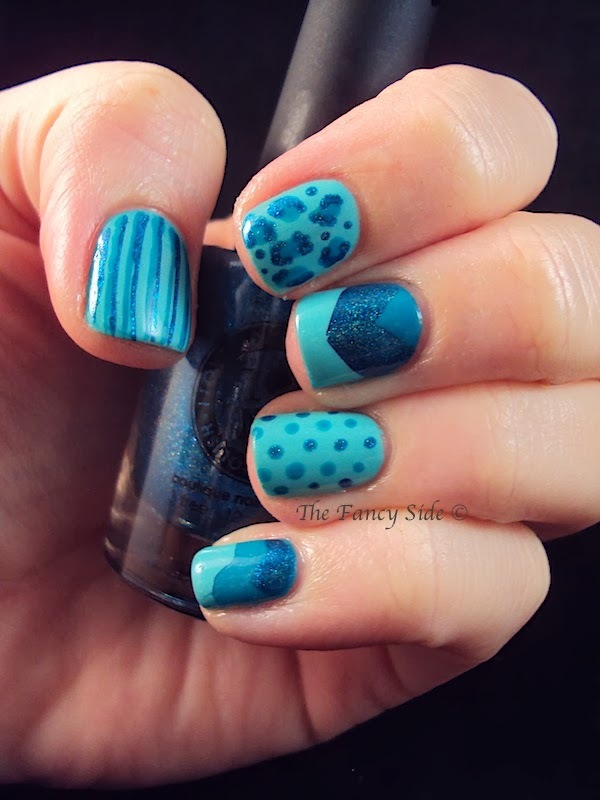 China Glaze Aquadelic (light teal), OPI Fly (dark creme teal), and I Love NailPolish's Admire Me (holographic teal) for this look. As you can tell my thumb got stripes, cheeta print on the pointer, chevrons for the middle finger, polka dots on the ring, and stair steps on the pinky. I love this manicure and kind of don't want to take it off, but I will tomorrow so I can put on other pretties. ;-) This manicure was inspired by u/annimus_prime of Reddit. I have no words for this polish. Okay maybe I do. Essie created a stunner with Belugaria. 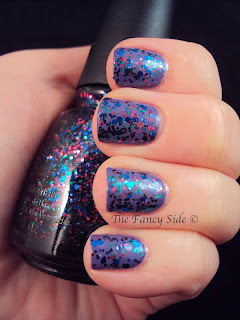 This polish is so ugly its pretty. 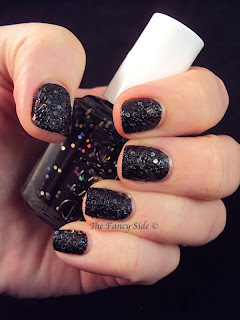 Its a black texture polish filled with holographic circle glitters. 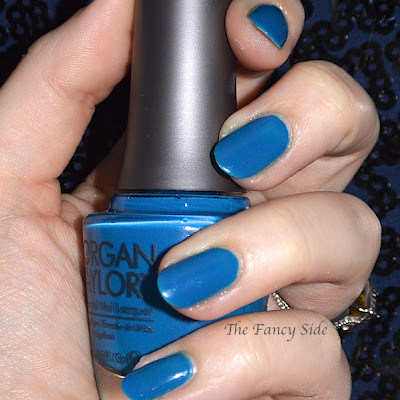 They give you the best flashes of color, that take this polish from boring to absorbing. Can you guys believe how pretty it is? Or are you on the ugly train? 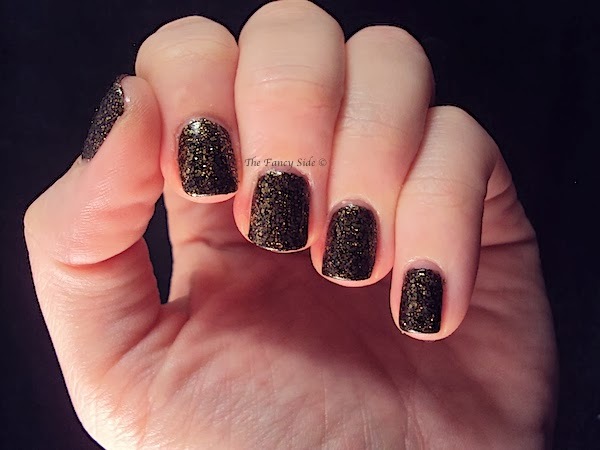 There seems to be very distinct camps when it comes to this polish. China Glaze makes the best full coverage glitter polishes. 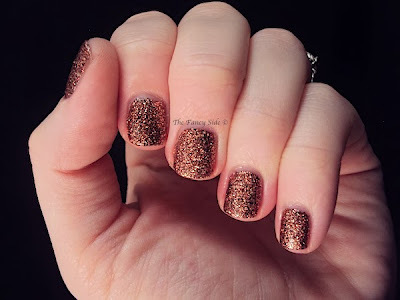 It seems like in every holiday collection there is at least 3 or 4 amazing full coverage glitters and I have to buy them all. I love a good glitter polish. 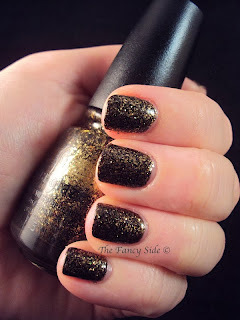 For this look I'm using 3 full coverage glitters from their current holiday question and 2 from last years collection. 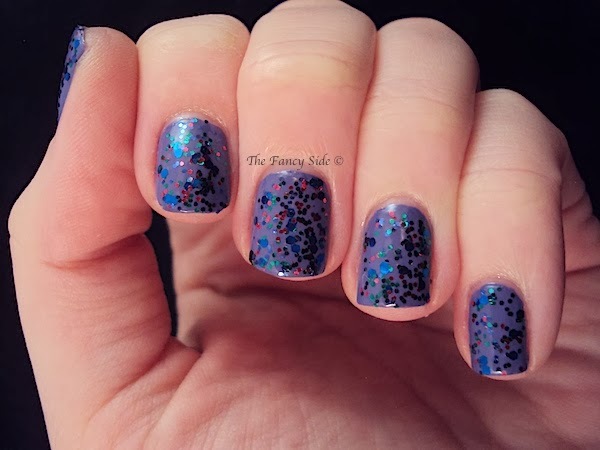 They are Champagne Kisses (champagne glitter, last year), Glistening Snow (silver glitter, last year), All Wrapped Up (blurple glitter, this year), This is Tree-mendous (green glitter, this year), and Put a Bow on It (raspberry glitter, this year). I'm in LAHOVE with this look. 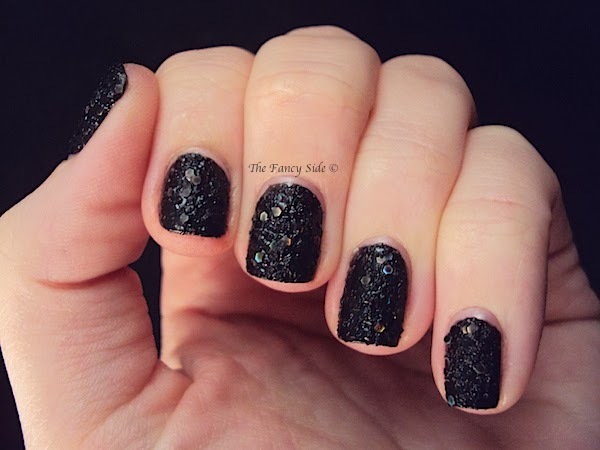 My line work (done in black acrylic paint) isn't as crisp as I'd like, but man, talk about sparkles! 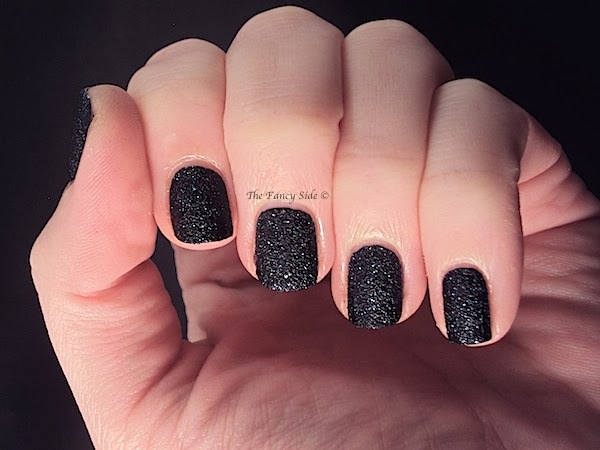 The black sets off the glitters giving them a depth that really shows their beauty even more. I was thinking about doing a tutorial for this look. Is that something you all would be interested in? Let me know. Yesterday, this was a top post on r/RedditLaqueristas. If you don't know about Reddit, I'm not sure if I should be sorry that I introduced you or proud of myself. Let me know later how I should feel. 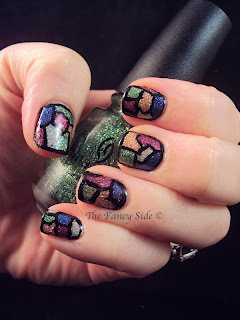 Anywho, my friend Brandon saw that post and requested that I do similar nails. So here is my ode to u/WarofArt and her pretty fingers. 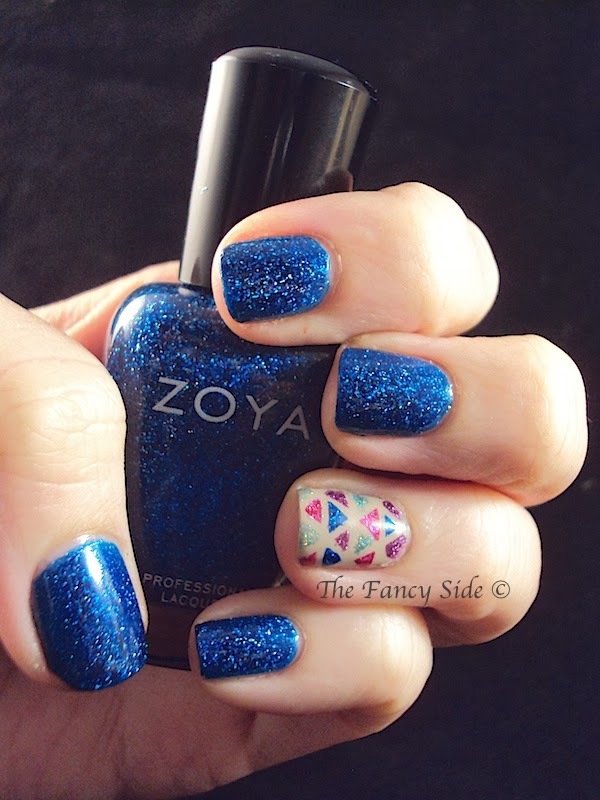 Since I just got Zoya Dream, from their Holiday Collection, I decided that I wanted to use that on all my fingers. 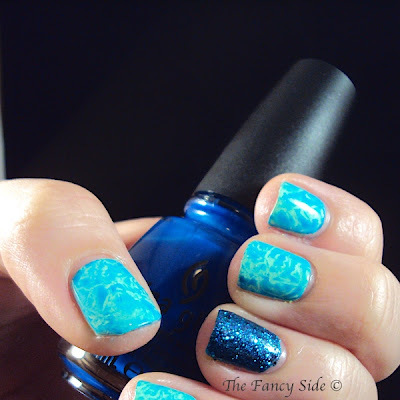 For the base on my accent nail I went with OPI Did You 'Ear About Van Gogh?. I then applied striping tape and filled in the triangles with Dream, Zoya Aurora (purple), Orly Miss Conduct (pink), and Orly Sparkling Garbage (green). I chose these four polishes because they all have similar shimmer within in the polish. 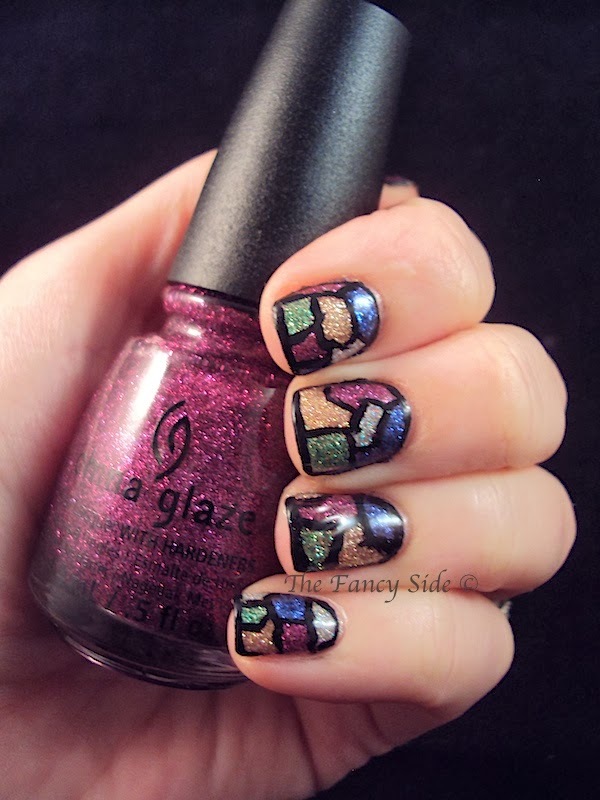 Love all of these polishes. Do you love this look, because I sure do. I would say that I like sports more than your average female. As long as its specific to the teams I like, I can name players, stats, facts, and have intelligent conversation. I cannot name stats and scores from 15 years ago about every sport and team ever like my fiance. I think this is a total guy thing and I do not get it. 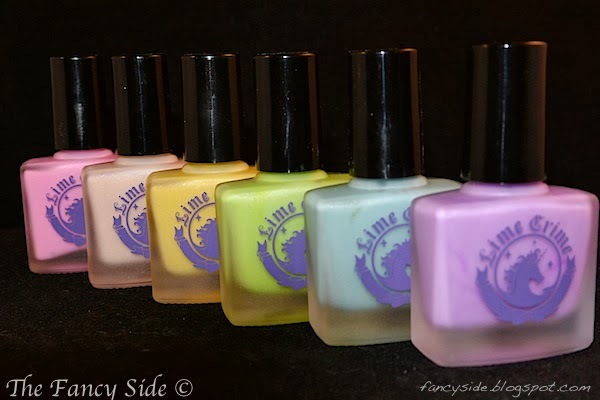 However, I can name polishes just by looking at them, so I've got that going on and I'm sure guys don't get it. 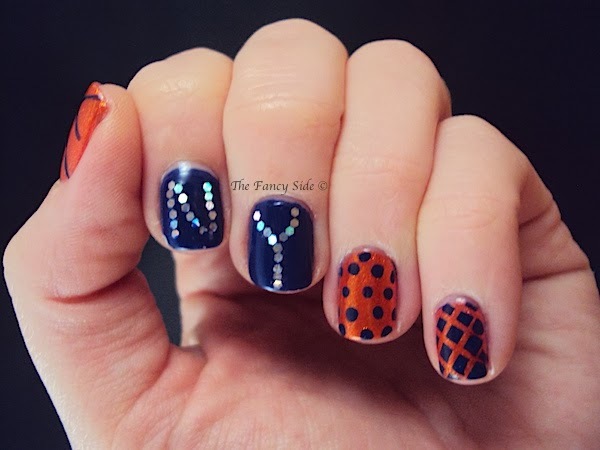 Anyways, my point is, that since I didn't have a NBA team affiliation, my fiance has declared I shall be a Knicks fan with him. I'm ok with this. We've got a good team, fun players, and a cool color scheme. ;-) The other day the future hubs and I grabbed some last minute tickets and went to Madison Square Garden to see the Knicks play. 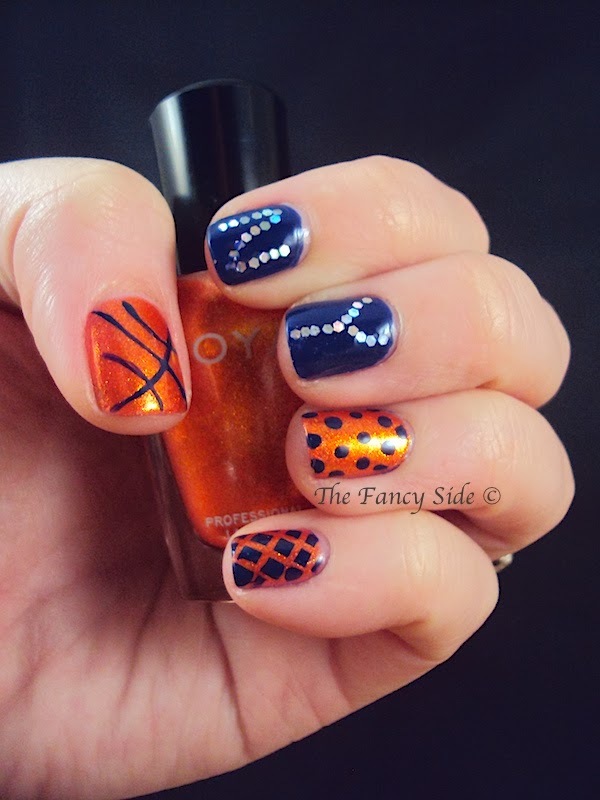 Of course I had to represent the team on my nails. 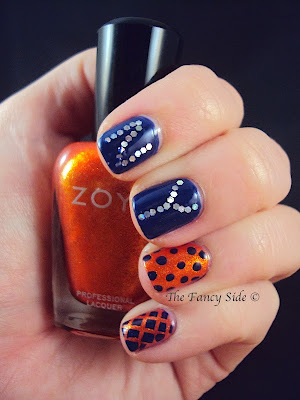 For these nails I used Zoya Amy (orange foil) and OPI Eurso Euro (navy blue creme). On my thumb I used a striper to apply Eurso Euro to create a basketball. 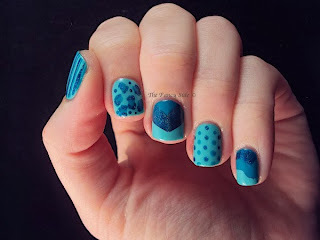 I used a dotting tool for the polka dots on my ring finger and striping tape for the net-esque pattern on my pinky. On my pointer and middle fingers I hand placed silver glequins to spell out NY. On my other hand, I switched the color scheme, so I have a rare picture of my right hand for you (I can tell you are excited). As you can see my striping, dotting, and tape skills are not as good on this hand but it was still a pretty good job. 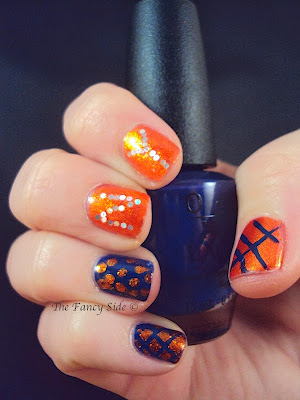 Do you ever get an idea in your head for a mani and walk around thinking about it till you can execute? That was me, prepping for this mani. I'm happy to report that it came out exactly like I wanted it to. Mani success!! For this look I used Orly Glam and Sally Hansen Complete Salon Manicure in Without a Stitch. 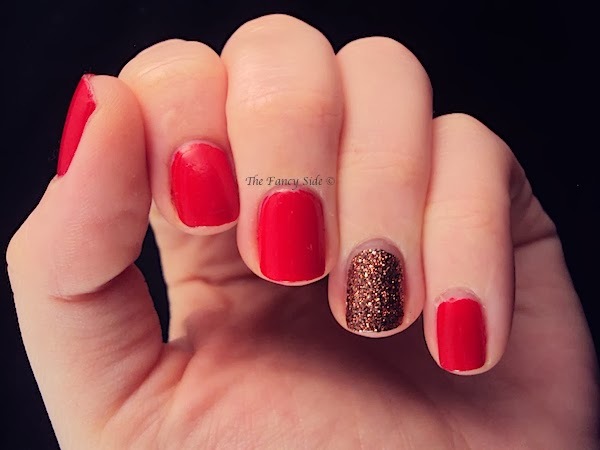 Glam is a jelly polish filled with red sparkles that is easily opaque after 2 coats. 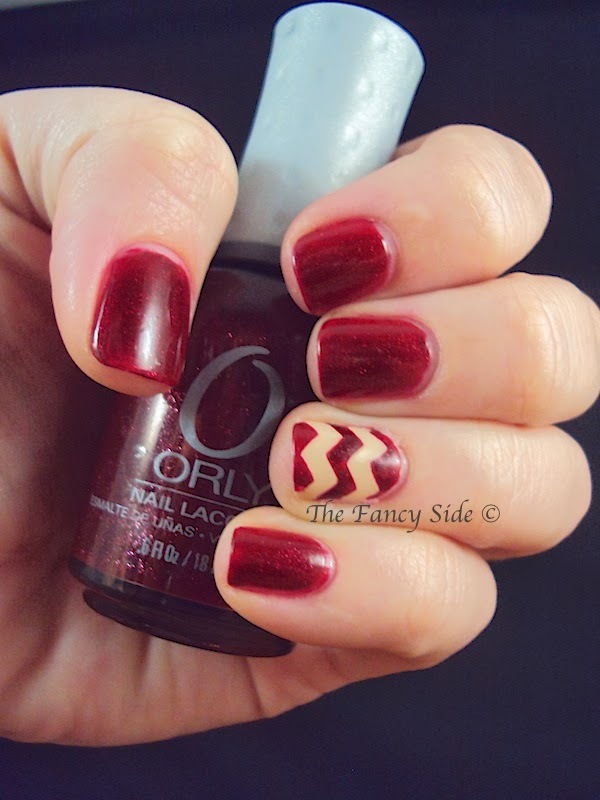 On the Orly website they list Glam as a purple jelly with sparkles, but it is definitely red in my book, a great color for fall. Without a Stich is a beautiful tan creme that applies easily. To create the chevrons I used these stencils from Sticky Nails (found on Etsy). I bought these on my own, and Iona doesn't have a clue that I'm saying this, but they are the BOMB! 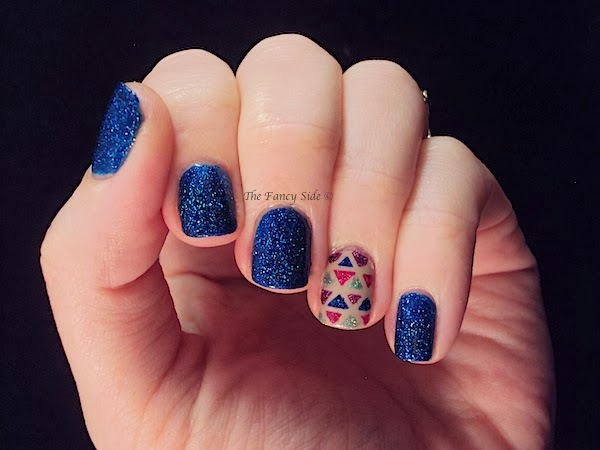 You get great coverage, crisp lines, and awesome designs, but be sure to stick them to your skin first so they don't pull your polish off. Also Iona is super sweet as my original package got lost. I let her know and within 3 days a new set had arrived in the mail.